If you had stopped by my house on Friday night you would have found me, limp and spent, swilling cheap Australian Pinto Noir and trying to work the aches out of my neck. Why? Because we went to the circus. It was not my idea. It was the daycare field trip. 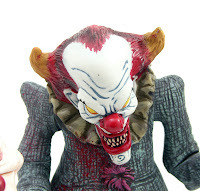 The Toddler and Two Year Old rooms were gonna go to the circus and damned if I was going to let my kid be the only kid who didn’t get to experience his first taste of unholy terror in the form of clowns. Because that’s the kind of great mom I am. Field trips require a one:one ratio of adults to kids so a lot of parents end up going on these things. That’s part of the appeal for many of us, I think: the opportunity to gab with moms you usually only see for about five minutes at drop-off or pick up. It also ensures that you only need to deal with the public behavior issues originating from your very own kid and you won’t be in trouble with other moms for letting their kid have a contraband fruit roll up if you think it might make the crying stop. So, I was looking forward to the circus outing. Really, how badly could it go? Well, um, let’s start with the metro ride. Or rather, the walk to daycare to metro. Or the run from daycare to the metro which culminated in me slinging my thrashing toddler over my shoulder fireman-carry style to keep him from getting us totally separated from the group and cutting down on my valuable gossip time with other parents. On the metro itself C. was so adorable I nearly passed out from it. He sat next to his friend T., looking like butter couldn’t melt in their mouths with their little legs stuck straight out in front of them and they asked me where we were going. I replied “The circus” and C. looked earnestly and T. and said “We go circus, T!”. The cute…it burns…. The circus was being held at a big arena downtown. I knew from a Tweet from ScaryMommy (another DC area blogger and just soooooo fabulous) the night before that there was a chance that PETA would be there protesting the animal acts and generally spoiling everyone’s fun but they weren’t in evidence. Or else they had been stampeded by the crowds of school kids coming in for the matinee. There were a shitload of kids there. The crowds were just crazy. I so hate crowds and my kid still wanted to run so I was struggling to contain him as we shoved through the walls of people to find our section. I had predicted that C. would be the kid voted Most Likely To Rush The Stage and I was not wrong. We got to our seats and he could see an elephant and a motorcycle down on the main floor and immediately began a chorus of “I want go down there, Mommy!” that didn’t abate until the motorcycle zoomed noisily away and C. dissolved into tears. Cue the credit card transaction: I bought him a shiny plastic motorcycle. Cost: $12. You have to understand something here: My parents drew a hard line on buying me and my sister overpriced plastic crap at circuses and other events. So, I am working out deep-seated feelings of deprivation through my son and find myself incapable of denying him any shiny object that strikes his fancy. I would seek therapy for this but I’m too broke from buying overpriced plastic crap. The Greatest Show on Earth finally began before I had a chance to spend any more of my own money and just in time for a pop-corn vendor to walk by and cause wails of wanton snack lust to emanate from my child. The mom sitting next to me took pity on my cash-less state and bought C. popcorn. Cost: $7. You can by a SILO of popcorn for $7. Jeez. But once we settled back with our popcorn and motorcycle, and the music swelled for the opening production number, I got one of those idyllic moments of parenthood wherein you child is totally entranced by the spectacle in front of him and you can bask his his wonder and amazement. For 25 minutes. For the rest of the 2.5 hour performance, you can run around the halls outside the arena after him because he didn’t want to sit still and watch acrobats or clowns. And you can ring up another credit card transaction to buy him a light-up spinning gizmo to stop the crying after he has to give back the one another child let him hold for a minute. Cost: $16. I could have probably found a way to mark this trip off in the win column if the ride back to daycare hadn’t been such an EPIC FAIL. C. was 30 minutes past nap time, unwilling to hold my hand so I was carrying him, and he kept bending double in my arms to reach into the bag holding the infernal popcorn and nearly causing both of us to topple over on escalators. I snapped at him, he sobbed, and I carried his very heavy, sobbing self much farther than I would have wanted at a speed-walker’s pace to get him back to school where his nap cot was laid out and waiting for him. The moral of the story of that 2 is probably too young for a full length circus performance. But…C. now sleeps clutching his overpriced plastic motorcycle so some good came of it all. I know what you mean. I am going to be a walking credit card receipt when J is old enough to beg! Also the picture. So. Cute. We had free tickets to the circus when Turtle was maybe 15 months or so. The result is that I am still afraid of clowns, and am now very familiar with our arena's concourse because that's where we spent the majority of the show. I can't imagine doing it with a throng of wee ones, though. You have my admiration. Okay, that first clown picture scared me.